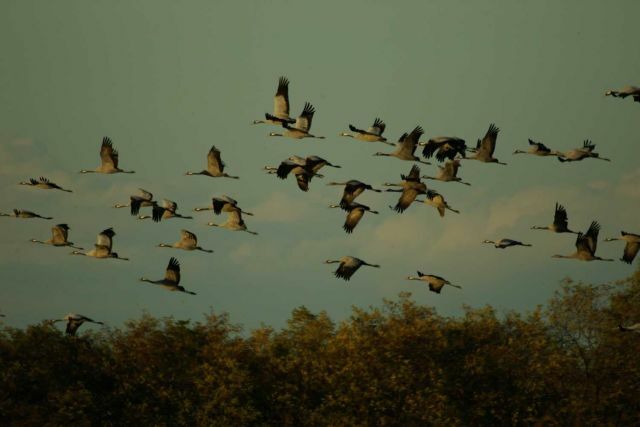 The migration of cranes (Grus grus) is a memorable late autumn experience. The number of cranes passing over the Hortobágy at the end of October can be as high as 85000. This bird also has a special role in Hungarian culture and traditions, therefore it is especially important to preserve their feeding and resting sites where they can gather strength during their migration. Cranes do not tolerate disturbance, and need sufficient feeding grounds as well. During the day the birds feed in the cultivated lands, picking up mainly corn seeds, but also catch small rodents and amphibians. Around noon they drink, then take a short rest near to the drinking site, in the afternoon continue feeding, then at sunset gather on the fishponds for the night - 20-30000 at the same time. Cranes arrive from North Europe. Their most important breeding sites are in Sweden and Russia, but can be found in other Baltic states, in Poland and in Germany as well. Cranes once used to nest in Central Europe, but due to the deterioration of their preferred breeding sites, such as large and undisturbed wetlands, the breeding population disappeared from the region. Cranes most probably nested also in Hungary until the middle of the 19th century. Cranes have been appreciated birds of Hungarian culture. Written history from the 16th century proves that cranes lived in households. The chicks were taken home and raised, and then kept for decoration and as sentinels: they are watchful guides and their loud cries were useful. Tradition says that the fortresses in the Hungarian Plain kept groups of cranes at the top of the walls, so that they notice enemies even in the darkness of the night. Cranes were sold on the markets, and their meat was eaten. The bones of the bird were used for carving different tools and instruments. The long feathers of the cranes were worn on the hats of shepherds with great pride. For their preservation undisturbed feeding and resting sites must be ensured. Hunting can be the most important factor that makes cranes leave a certain resting place, therefore hunting activities in the region during crane migration should be totally banned. For their feeding, cranes need rather large fields with corn or fresh sowing, and also some undisturbed channels, fishponds or flooded areas for their midday drinking session. 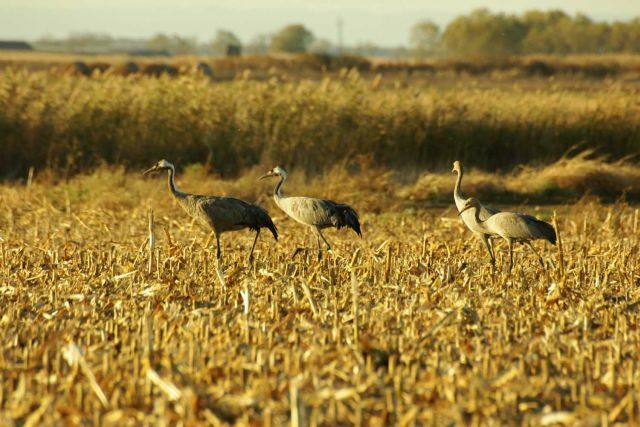 Farmers should be informed and supported in maintaining the land-use patterns and structures that allow the cranes to peacefully fill up their reserves in Hungary for the long way ahead of them before reaching the wintering sites.